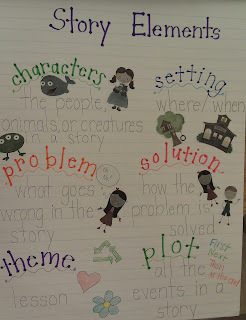 After covering the elements of nonfiction, I moved onto story elements. 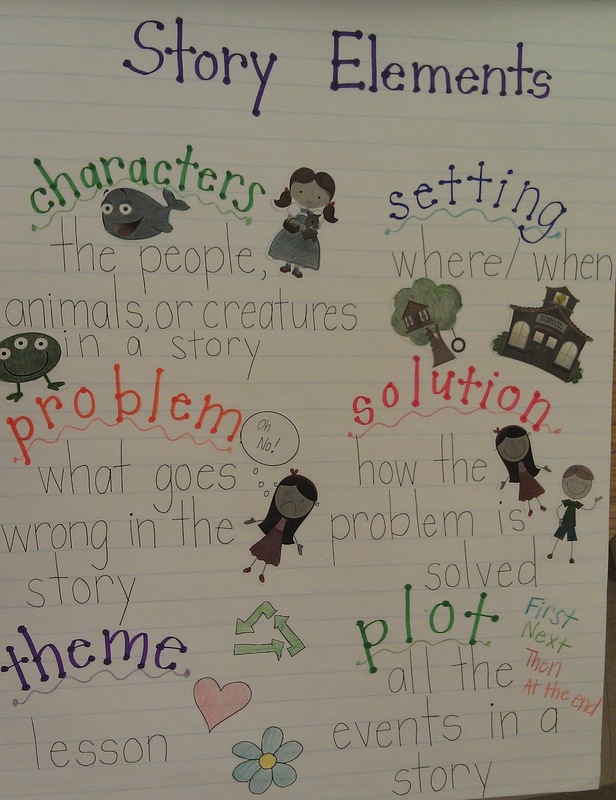 I chose to focus on characters, setting, problem, solution, plot, and theme. 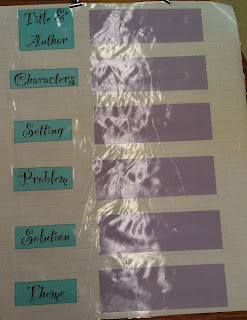 This is the anchor chart I used to introduce the concepts. 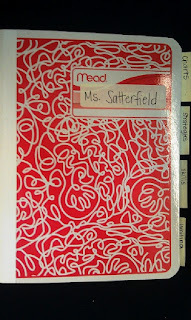 The pictures I used on the anchor chart can be found at: http://www.teachingblogaddict.com/2012/08/teacher-featurea-year-of-many-firsts.html. 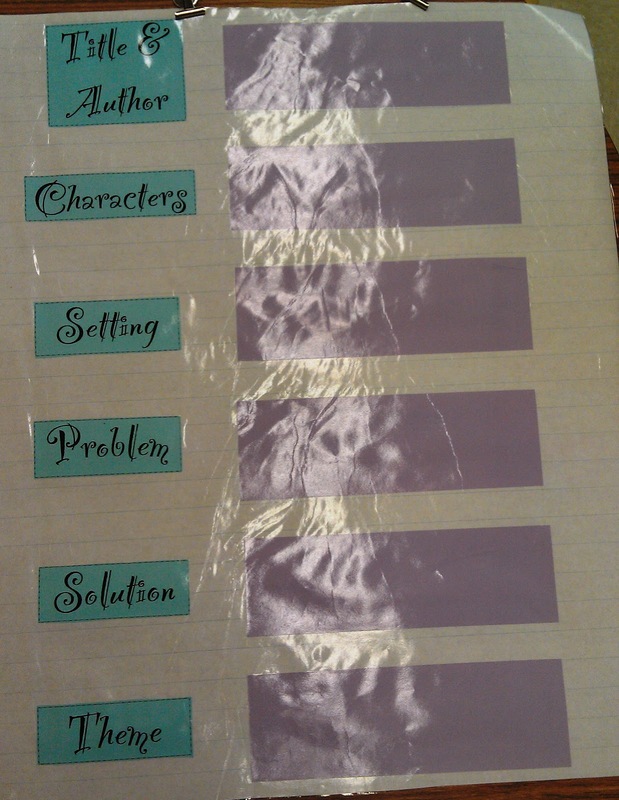 Students glued a copy of the anchor chart into their reader's notebooks under the tab "charts." This way students could refer to the chart anytime that they needed it. I loved seeing kids going back to their charts without any prompting! Folktales are one of my favorite genres for teaching story elements. They usually have very clear problems, solutions, and themes. This also gave us a chance to discuss the genre and add a tally mark to our genre tally list! Beth Newingham has a great "genre overview" handout and "genre tally sheet." 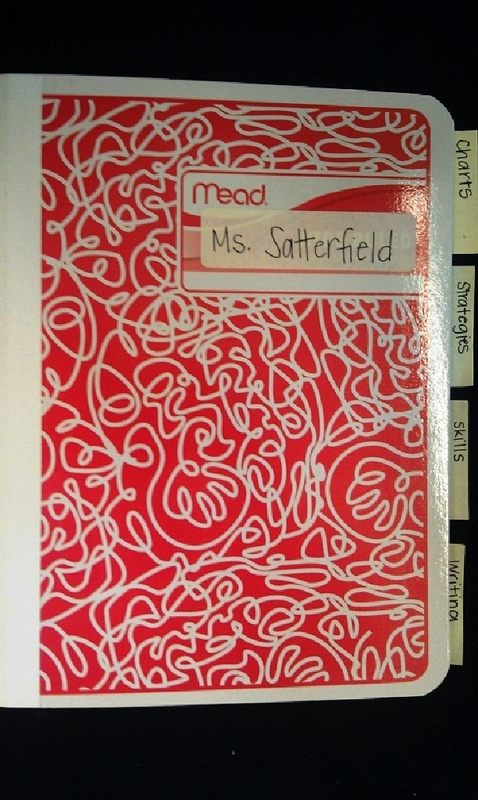 (http://www.scholastic.com/teachers/top_teaching/2009/11/readers-notebook) My students and I add a tally mark for everything that we read. It is a great way to continuously teach and review genres. For this lesson, I used the folktale "Papa's New Pants" from an old edition of Highlights magazine. I found the story on www.infohio.org. In this story, Papa buys a pair of pants that need hemming. Everyone in his family is too busy to help him hem his pants. Eventually his family feels guilty and each one of them hems his pants without the others knowing. His pants end up way too short! Then the family works together and makes the pants into shorts. The kids really loved this story. After reading and discussing the short story, students answered the questions: What kind of family does Papa have? How do you know? in the writing section of their reader's notebooks. Then we completed a story map together. Sorry for the glare! Lamination and fluorescent lights do not mix well! We went through each element for "Papa's New Pants" and added them to the chart using post-it notes. You have probably seen charts like this all over Pinterest! At this point, students referred back to the anchor chart in their reader's notebooks if they needed help.